As you age, your circle of friends gets smaller. Really good friends who are there for you, they weather the storms with you, they celebrate the everyday victories with you…weddings, husbands, house hunting, countless birthdays, babies, careers, teething, potty training, schools – life. You work at friendship, you keep up with each other, and you support each other. You don’t always see eye to eye on politics, parenting styles, or career moves, but you don’t let it drive a wedge between you. We still have our sorority sisters, our buddies from high school, and our dependable colleagues…but distance, obligations, and time all take their toll. Days, weeks, and years go by. You blink and you pass another reunion, miss another life event, and time ticks on. My friend J, is one of those weather the storms friends. She lived with Man and I for a bit after college. She was about to move across country, her apartment lease was up and Man was in paramedic school. It was awesome to have a roommate while Man worked away the days and studied away the nights. J has never known me not married to Man. She didn’t know me in high school. She only knows adult me. She has moved all over the country, but every few years she comes back home. She’s like a boomerang. Ooooo – I may have just found a new nickname. We play with the kids, go grocery shopping, and hang at the museum. On shift nights, we make cotton candy; we have breakfast for dinner, drive through Arby’s, and when she moves again, it makes me sad. Never the less, we still make kids’ birthday parties, babies’ births, and those big moments. We keep our weekly phone dates, and remember the passing birthdays. We share the same middle name, a fondness for boxed pasta salad, an appreciation for a restaurant drink so strong it can only be called “cup of drunk”, and contentment in just doing every day, normal stuff together. Today, in honor of J – breakfast for dinner, the BEST pasta salad, and my picks of the best places in Fort Worth to take kids. Happy Birthday J & hurry home! http://www.fortworthzoo.org/ I can’t tell you how much my family loves this zoo. They have a trading village, petting area, renown Museum Of Living Art, touch tank, and an amazing selection of animals. http://fortworthmuseum.org/ This museum is designed with children in mind and is very interactive. My boys love the hands on centers with lots of opportunity for creativeness and exploration. There is a section for smaller children focused on imaginative play and one for older children focused on building things. The museum has rotating exhibits, houses the Cattlemen’s museum, and boasts a planetarium and IMAX theatre. Don’t worry, they still have dinosaur bones. http://www.mountasiafamilyfuncenter.com/ This place is miniature golf on steroids. In addition to two different mini-golf courses, you can rock climb, paddle boat, battle out laser tag, play arcade games, hit a few at the batting cages, or take a spin on their go carts. Need somewhere to eat with kids in tow? Try out Tim Love’s Woodshed (BBQ), the Clear Fork Food Truck Park (smorgasbord), or the Mellow Mushroom (pizza, hoagies). Shift nights often bring about creative dinners – including breakfast for dinner. 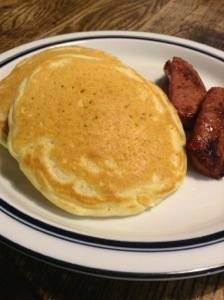 Here is one of my easiest throw together breakfast for dinner meals. Preheat oven to 375*. In a skillet, brown sausage (throw in some onion & peppers if you’re feeling fancy). When meat is almost cooked through, toss in the hash browns to thaw and begin to heat through. Season well with salt & pepper. In another bowl, beat eggs and milk together with green chilies – set aside. Grease an 8X8 pan. Sprinkle sausage and potatoes in pan. Pour over egg mixture. Bake for 30-40 minutes, topping with cheese for last ten minutes (after all of egg is set). Want less mess? If your skillet is oven proof, pour the egg mixture over the meat and potatoes and cook right in the skillet. *Don’t feel like turning on the oven? After adding eggs, reduce heat to low, cover and cook on the stovetop. These are two of my favorite essential breakfast recipes. Marinate the pasta, tomato, garlic, and onion over night in olive oil and Greek seasoning. Before serving, toss with whatever mix-ins you chose. Drizzle with some additional olive oil. The pasta absorbs A LOT of oil, so drizzle liberally. Go crazy and shake on some flavored vinegar. If you have a garden full of fresh herbs, 1 tablespoon of fresh to 1 teaspoon of dried is the normal conversion. I would recommend using a mortar and pestle to crush and mix the herbs.